We are Rhodesian Ridgeback owners of long standing who occassionally have litters. We are not commercial breeders, but Rhodesian Ridgeback enthusiasts, and consider our hobby a lifelong passion. We pride ourselves on soundness and excellent temperament. 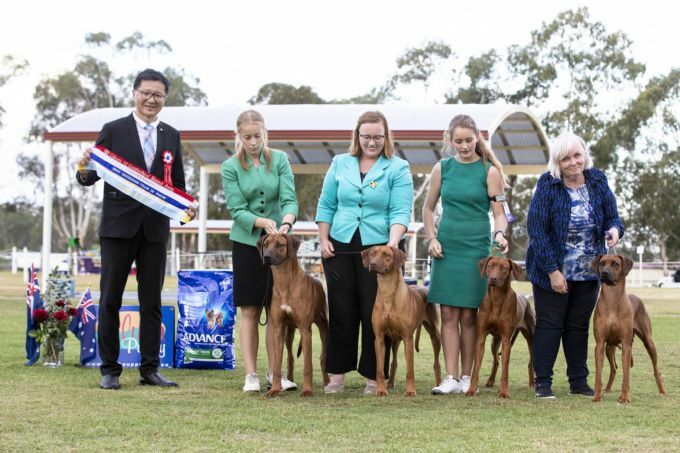 In the past two out of three decades we have consistently shown a number of Rhodesian Ridgebacks to their titles, and won a number of In Show and In Group awards at both All Breed, Group and Specialty Levels. We did set multiple original Australian records over 30 years ago! We pride ourselves on having quality ridgebacks that display all characteristics of the breed. Please feel free to contact us by phone or email to discuss this wonderful breed. At the moment you can see us in the show ring with a few of our wondeful companions.